The recipe for this tiki party crowd-pleaser (and I do mean a crowd!) is courtesy of Martin Cate, owner of Smuggler’s Cove in San Francisco. This can be served in several bowls placed throughout a party area or one enormous vessel. Want to set this baby on fire? Here’s Martin Cate’s recommended technique: You’ll need a 1-inch square of white bread, left out to dry overnight. Soak the bread in lemon extract, then place it in a hollowed-out lime hull. Float the lime hull in the punch and use a long match or lighter to set it on fire. This will create a dramatic tall yellow flame. Just be sure to have a pitcher of water and tongs on hand! If the bread starts to blacken and smell like toast, grab it with the tongs and dunk it in the water to extinguish the flame. A riff on the classic Arnold Palmer, this recipe is courtesy of Stephen Savage, general manager and beverage director at New York City’s Tipsy Parson restaurant. Savage serves this in a glass Mason jar – the type used for home canning. To serve it to a crowd, look for a large glass jar with a spigot toward the bottom. For a while, Ball (a canning jar manufacturer) made one-gallon jars like this. If you can find a couple of those, they would be ideal. In a small bowl, pour the hot water over the tea bags and let steep for about 15 minutes. Remove the tea bags, pressing gently to extract the liquid before discarding. Let cool to room temperature. 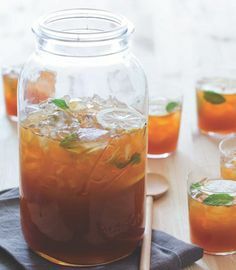 Pour the steeped tea into a container that holds at least 6 quarts. Add the vodka, lemon juice, and mint syrup and stir until thoroughly blended. Add the ice and stir well to chill. To serve, pour into pint canning jars or similar-size glasses and garnish each drink with a sprig of mint and a lemon wheel. In a small saucepan, combine the sugar and water. Cook over medium-high heat, stirring constantly, until the sugar is dissolved. When the syrup starts to boil, lower the heat to maintain a simmer. Gently roll the mint between your hands to release the aromatic oils, then add it to the syrup. Cook, stirring occasionally, for 10 minutes. Let cool to room temperature, then remove the mint sprigs and strain the syrup if need be. Stored in a covered container in the refrigerator, the syrup will keep up for about 2 weeks. Part of this cocktail can be mixed well ahead of party time, but add the club soda and mint leaves just before serving. That way you’ll have maximum fizz, along with fresh mint aroma, rather than wilted herbs at the bottom of the pitcher. 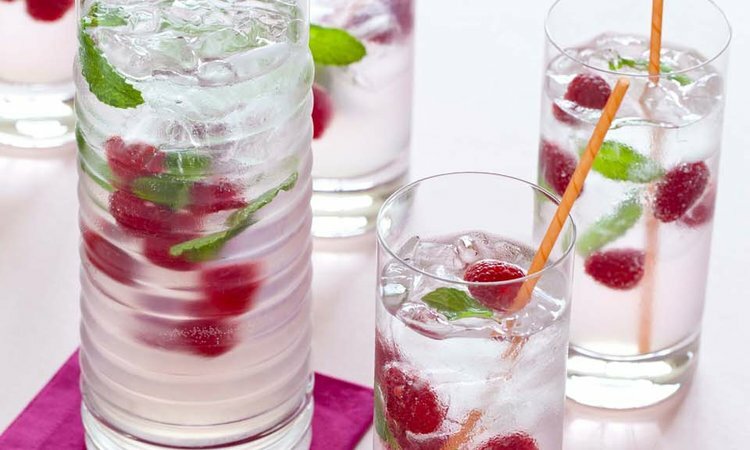 For plain mojitos, omit the raspberries. 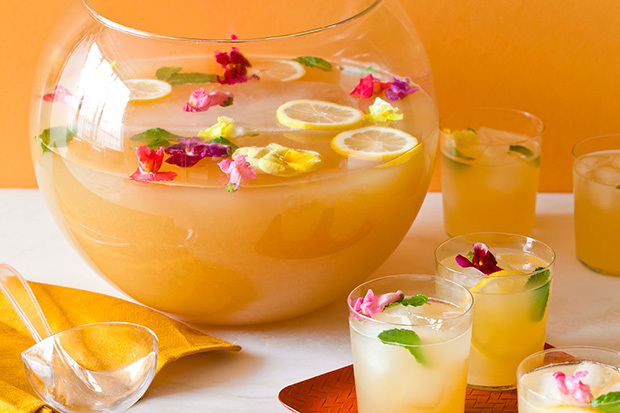 In a pitcher that holds at least 12 cups, combine the lime juice and sugar and stir until the sugar is dissolved. Add the rum and raspberries and stir gently. Just before serving, pour in the club soda and stir gently. Gently roll the mint between your hands to release the aromatic oils, then add it to the pitcher. Add the ice and stir gently to chill.